Join Capitol Hill’s newest P-Patch, the Howell Collective Garden at 16th Avenue and E. Howell Street, as we sow the seeds of community! 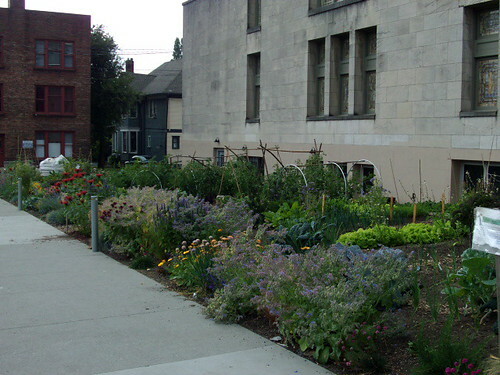 On Sunday, April 29, we invite the community to learn about and celebrate the urban agricultural movement taking place in public spaces throughout Seattle. We will meet at Seven Hills Park (also at 16th and E. Howell) for a walking/biking tour of local gardens in and around Capitol Hill, then return to the Howell Collective P-Patch for a tour and BBQ. The Howell Collective P-Patch is located in Seven Hills Park. All are welcome to join and encouraged to bring a dish to share at the BBQ. The event will carry on rain or shine. The event will also kick off our logo design contest. Submit your garden logo ideas on April 29 and check back for details; we plan on presenting our winning logo at our summer harvest festival. For more information, email howellcollective@gmail.com or visit https://www.facebook.com/events/215649655211097/ for the latest event updates. A unique joint meeting of Historic Seattle and the Woman’s Century Club will be held on Friday, April 20, at noon at the Harvard Exit Theatre. Members will speak about the club’s history; rarely seen artifacts from the club’s archives will be on display; and short tours will be given, with special attention to the building’s former role as the clubhouse for the Woman’s Century Club from 1925 to 1968. The program is free and open to the public. A light lunch will be available. 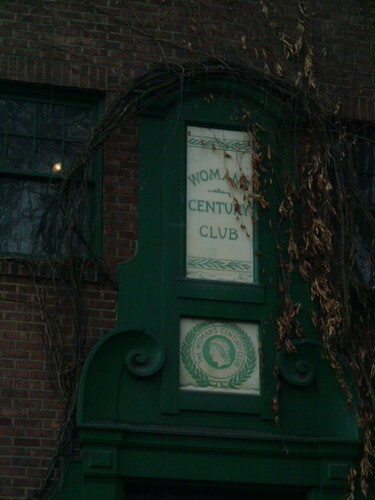 The Woman’s Century Club was founded in 1891 – 121 years ago – by a small group of trailblazing Seattle women, including a 32-year-old suffragist who would go on to become world-famous – Carrie Chapman Catt. She was a protégé of Susan B. Anthony, and after women got the right to vote in 1920, she went on to found the League of Women Voters. 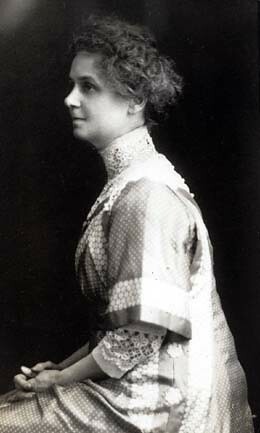 Another early member of the club was Emily Inez Denny, a painter and a daughter of the pioneering Denny family. Her club activities included delivering a paper, in 1899, on the founding of Seattle and the Indian War of 1856 – the latter an event she experienced as a three-year-old girl, when she was carried to safety in the city’s blockhouse in her mother’s arms. By the 1920s the club numbered several hundred women, and they undertook the task of constructing a clubhouse, choosing a site at 807 East Roy. The clubhouse opened in October 1925, and the building was formally dedicated in May 1926. The total cost was just under $60,000. For more than 40 years the building hosted the club’s meetings, talks, teas, receptions, theatrical presentations, and other events — even a 1933 reception for Amelia Earhart, having sponsored her trip to Seattle. And in 1926, the club women helped elect Bertha Landes, a former club president, as the first, and still only, woman mayor of Seattle. Less is known about the club’s history from the 1940s on, as research on this period has just begun. The club was quite active in the 1940s and 1950s, even maintaining a lively daughters’ auxiliary called the Juniors, but in the ’60s it may have become overwhelmed by the financial challenges of maintaining the building. In 1968 the club members sold the clubhouse, and it eventually reopened as the Harvard Exit movie theater. A clause in the contract of sale, however, requires maintenance of the parlor as a meeting place for the club. All of the furnishings and artwork in the parlor, and the Steinway piano, remain the property of the club, and members still meet in the parlor, on the third Friday of the month, to this day. 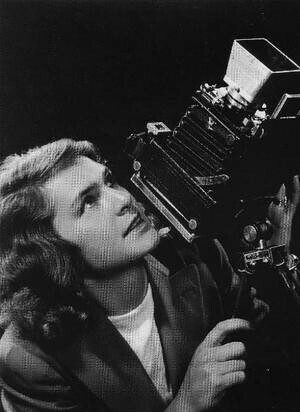 Today the club is a small but growing group of women of diverse ages and professions, and it welcomes new members. This year it has presented monthly luncheons and speakers on women’s history, the arts, and community service. For information on future events or on joining the club, visit the club’s Facebook page or its website, womanscenturyclub.org. On Fri., March 16, at noon, Dr. Lynne Iglitzin will present an illustrated talk, “Trail-Blazing Photojournalist: Margaret Bourke-White,” at the Woman’s Century Club, a 120-year-old social club founded by suffragist Carrie Chapman Catt. The club meets in the parlor of the Harvard Exit Theater, 807 E. Roy. The presentation is open to the public; a $5 donation for lunch is suggested. Lynne Iglitzin was a professor of political science at the University of Washington for many years. She is the author of several books, including Women in the World. She has chaired the Seattle Human Rights Commission, and served on the boards of the ACLU of Washington State and the Northwest Women’s Law Center. She is a founding board member of Youth in Focus, a program promoting photography as a tool for motivating youth, and she holds a Ph.D. in political science from Bryn Mawr College. The Woman’s Century Club hosts monthly programs and luncheons on the third Friday of each month in the parlor of the Harvard Exit Theater. The club’s website, www.womanscenturyclub.org, lists upcoming events. The club also awards an annual scholarship to an outstanding female student. Dr. Iglitzin’s talk is presented in conjunction with National Women’s History Month, and is sponsored by Humanities Washington (www.humanities.org) through its statewide Speakers Bureau. The Speakers Bureau brings Washington’s finest scholars, historians, musicians, and storytellers to local communities to give dynamic presentations at libraries, schools, museums, and other community organizations. The life of Dr. Cora Smith Eaton, a dedicated suffragist who climbed Mount Rainier in 1909 and helped found the Mountaineers Club, is the topic of a free talk sponsored by the Woman’s Century Club at noon on Fri., Feb. 17, at the Harvard Exit Theatre, 807 E. Roy, Seattle. The talk will be given by Shanna Stevenson, coordinator of the Washington Women’s History Consortium in Olympia. The public is warmly invited to attend; to reserve a seat, email president@womanscenturyclub.org. Dr. Cora Smith Eaton graduated from Boston University School of Medicine, and in 1892 became the first woman to practice medicine in North Dakota. She attended a 1905 suffrage convention in Portland and climbed Mount Hood afterward, then moved to Seattle and set up a medical practice. She was the first woman to reach the East Peak of Mount Olympus on August 15, 1907, in what is now Olympic National Park, and went on to summit all six major peaks in Washington. Along with 76 other women and 74 men, Dr. Eaton was a founding member of The Mountaineers Club, and during the club’s third annual outing to Mount Rainier, in July 1909, she planted a “Votes for Women” banner at the summit. More information on this expedition is available at HistoryLink: http://www.historylink.org/index.cfm?DisplayPage=output.cfm&File_Id=8578. The speaker, Shanna Stevenson, has a B.A. in history and education from Gonzaga University and is the author of the book “Women’s Votes, Women’s Voices: The Campaign for Equal Rights in Washington.” Her book will be available for purchase at the talk, and she will be happy to autograph copies. The event is co-sponsored by Elliott Bay Book Co. The Woman’s Century Club was founded by suffragist Carrie Chapman Catt, a protege of Susan B. Anthony, in Seattle in 1891, and is being revitalized by a new generation of women. Today’s club presents free monthly programs that connect and inspire women, and awards an annual scholarship to a deserving woman student at a Seattle-area college or university. The club welcomes new members; for more information, visit www.womanscenturyclub.org or find us on Facebook. NOTE: This event has been **POSTPONED** due to poor travel conditions; we’ll reschedule at a later date. To receive an invitation when we do, email pr@womanscenturyclub.org with “subscribe” in the Subject line. They will speak on Friday, January 20, at noon in the parlor of the Harvard Exit Theatre, 807 E. Roy Street. The event is free, and the public is warmly invited to attend; to reserve a seat, just RSVP to president@womanscenturyclub.org. Becker and Stein are both staff historians at HistoryLink.org. 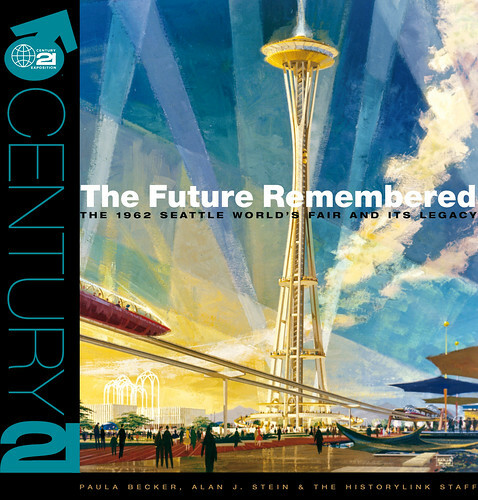 The book was published by the Seattle Center Foundation in conjunction with the Next Fifty, an upcoming six-month citywide celebration of the 50th anniversary of the Seattle World’s Fair that begins on April 21. Their book will be available for purchase, and they will be happy to autograph copies following the talk. The event is co-sponsored by Elliott Bay Book Co. The Woman’s Century Club was founded by suffragist Carrie Chapman Catt, a protege of Susan B. Anthony, in Seattle in 1891. It constructed the Harvard Exit Theatre building as its clubhouse in 1925, and its emblem can still be seen above both entrances. Dues are $50/year, and the club welcomes new members; for more information, email president@womanscenturyclub.org, visit www.womanscenturyclub.org, or Like the Club on Facebook.